While addressing the business community here at Multan Chamber of Commerce and Industry (MCCI), he said that Multan had one of the best hospital buildings compared to other buildings of Railways. The business community should take over it and serve the countrymen. Pakistan Railways would also provide staff to facilitate the businessmen, he said added that Pakistan Railways had over 400 acres of land available in Multan and some other districts in the region and businessmen should get it on lease for setting up plant nurseries. The businessmen should play their effective role for progress and prosperity of the country. The minister said 38 trains including eight express ones stop in Multan, and one more express train is being scheduled to stop at Multan railway station in near future while Zakariya Express would also get new coaches. Work on another 230 coaches is being carried out currently, he maintained. 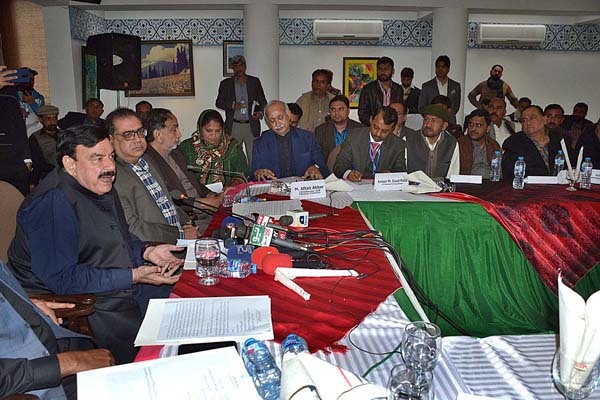 Sheikh Rashid said that Pakistan Railways had set target of running 20 freight trains also. He urged businessmen to run freight trains and pay rent to Pakistan Railways. He expressed satisfaction over the excellent railways track. He also extended offer for provision of coaches on rent basis for transportation of fruits and vegetables. He said that strict action would be initiated against passengers travelling without tickets. Speed of trains would be improved from 120km to 260km per hour, he added. Earlier, Muhammad Sarfraz, the president of Multan Chamber of Commerce and Industry, presented different demands. He called for restoration of Shah Rukn-e-Alam train, changes of coaches of Bahauddin Zakariya Express, making Multan a stop of Greenline Express, facility of advance reservation, particularly for traders and industrialists, changing of timings of trains running between Lahore and Multan. On this occasion, representatives of different chambers of south Punjab were also present.